, a learned physician of Ireland, was born at Ardbraccan in the county of Meath. | in 1622, in tfie house of his uncle, the celebrated archbishop Usher, but then bishop of Meath. He was educated in the college of Dublin, of which he became a fellow, but was ejected by the usurping powers for his loyalty. 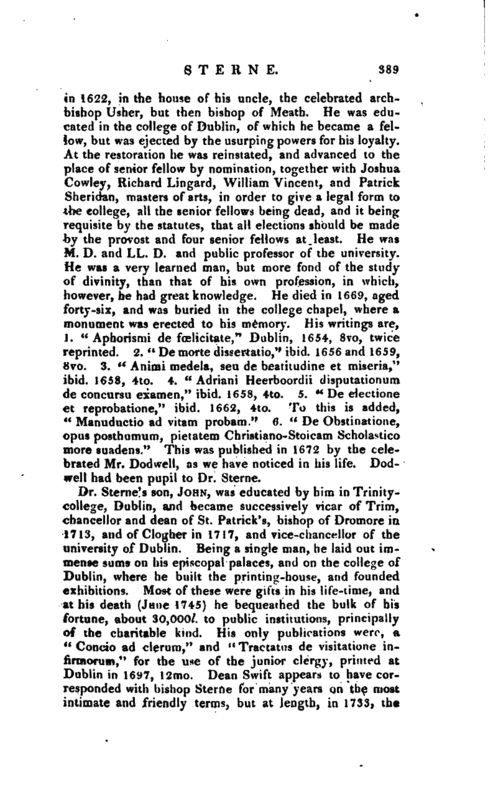 At the restoration he was reinstated, and advanced to the place of senior fellow by nomination, together with Joshua Cowley, Richard Lingard, William Vincent, and Patrick Sheridan, masters of arts, in order to give a legal form to the college, all the senior fellows being dead, and it being requisite by the statutes, that all elections should be made by the provost and four senior fellows at least. He was M. D. and LL. D. and public professor of the university. He was a very learned man, but more fond of the study of divinity, than that of his own profession, in which, however, he had great knowledge. He died in 1669, aged forty-six, and was buried in the college chapel, where a monument was erected to his memory. His writings are, J. “Aphorismi de frclicitate,” Dublin, 1654, 8vo, twice reprinted. 2. “De morte dissertatio,” ibid. 1656 and 1659, 8vo. 3. “Animi medela, seu de bearitudine et miseria,” ibid. 1658, 4to. 4. “Adriani Heerboordii disputation um de concwrsu examen,” ibid. 1658, 4to. 5. “De electione et reprobatione,” ibid. 1662, 4to. To this is added, “Manuductio ad vitam probam.” 6. “De Obstinatione, opus posthumum, pietatem Christiano-Stoicam Scholastico more suadens.” This was published in 1672 by the celebrated Mr. Dodwell, as we have noticed in his life. 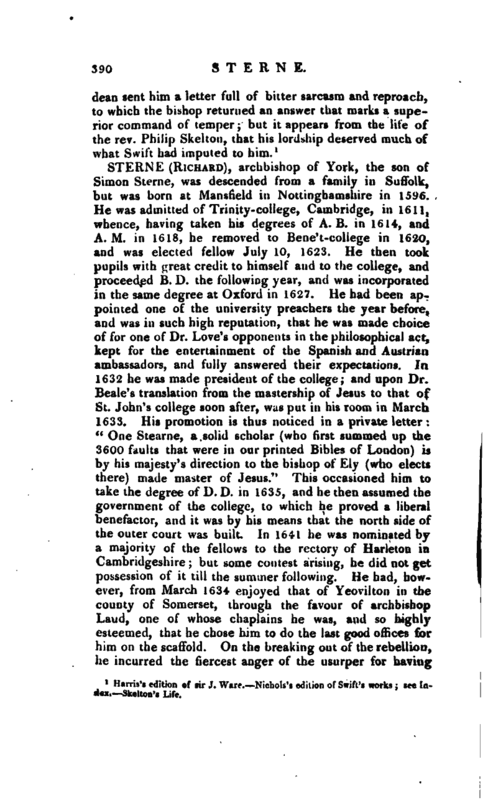 Dodwell had been pupil to Dr. Sterne. 1 Harris’s edition of sir J. Ware. 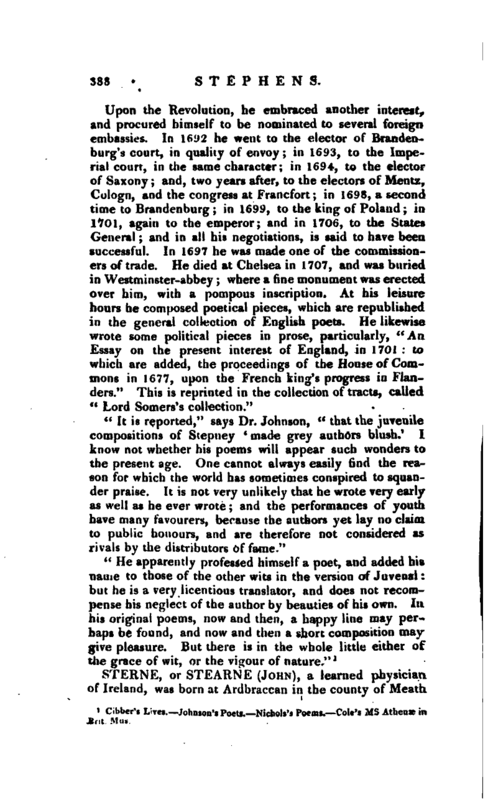 Nichols’s edition of Swift’s works; see Index. Skeiton’s Life.